Why the 'Life on Mars' ending was a steaming pile dumped on a brillaint show. So recently, my head nearly exploded when I watched the ending to one of my favorite TV shows, Life on Mars. It was a brilliant show about a detective named Sam Tyler. While investigating a crime in 2008, Detective Tyler is hit by a car and sent back to 1973. Whether he was really sent back in time or this was all part of a dream while in a coma is the framework around which daily crime solving and great character interaction occured. It was one part 70's crime drama, one part science fiction. 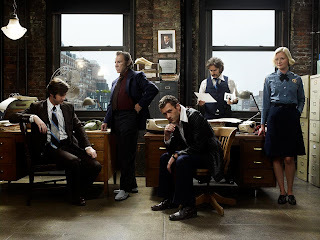 It managed to get Harvey Keitel surrounded by a great cast for one of the best scripted and most interesting shows that I have ever seen. Sam Tyler was in a deep space sleep dream on a real mission to Mars with the 2032 versions of the 1973 characters he had been interacting with. They passed an asteroid that caused his dream (and only his) to glitch into 1973. The Good: As my friends Samantha and Nick pointed out to me, a lot of this was set up. - They referred to Sam as "spaceman" on the show due to his rant about where his computer went, and lo and behold, he really was a spaceman. -The random land rover that kept showing up...looked like his spaceship. -All the crew members were able to choose their own dream state (as Ray reminded them). Sam CHOOSES to go to 2008, have a fake fiance get abducted, and freak out trying to find the abductee/serial killer? Even for a sadist, that is pretty rough. -Like Sam, I fell in love with Annie; Farrah Faucette haircut and all. Their relationship and that first kiss was enough to make a guy care about the love story as much as the murder and mayhem. Now he wakes up in 2032, and has feelings for this girl based on her personality in a glitched dream that she has no recollection of. Not the payoff I was looking for. -All the mortal peril that Sam was in, all the crimes he and his team helped solve, all their losses of loved ones, and the help he gave himself as a young boy was pretty weightless (pun intended) in the end. -One of the main bad guys....ends up being their mission director....who is actually a nice guy in 2032. -In 1973, Sam's dad is a sadistic jerk. Lt. Hunt ends up being his father figure...which works great because he really is his dad in 2032! Never mind that he was willing to kill his "made up" dad in 1973; Lt. Hunt ends up being his waaaay too old to be an astronaut dad that he loves. I have ranted endlessly to friends about how much I hated all this. My wife, Karen (who called the ending before it happened), agrees with me that it was pretty stupid, but apparently I am at odds with many TV critics and many of the show's fans. So...any of you have some counter points?